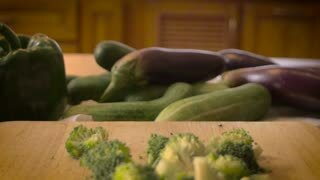 Search Results for "Food slow"
Fresh cut vegetables broccoli, with eggplant and green peppers in the background, and cucumbers on a cutting board. An example of healthy eating, farm to table, organic real food slow food dolly push out shot. Person getting food out of the cupboard while making food. Slow zoom in. Shallow depth of field. 24 fps. 1080p. Person getting food out of the cupboard while making food. Slow zoom out. Shallow depth of field. 24 fps. 1080p. Person stirring bowl of food. Slow pan to the right. Shallow depth of field. Person seasoning food. Slow zoom in. Shalow depth of field. Person seasoning food. Slow pan to the right. Shalow depth of field. Man taking cover off of hot food. Slow zoom in. Shallow depth of field. Man salting hot food. Slow zoom in. Shallow depth of field. Man putting cover on smoking food. Slow zoom out. Shallow depth of field. Video 1920x1080 - Seagulls flying above sea waves during the storm in search of food. Slow zoom in effect. Person stirring bowl of food. Slow zoom in. Shallow depth of field.